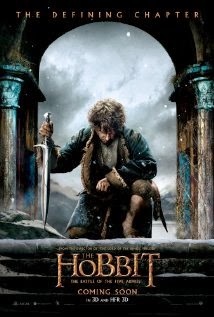 I cannot believe I saw the last movie in the franchise of hobbits, elves, dwarves, wizards and men. A fantasy world brought to us by Peter Jackson is over — movies that sucked us in and provided an escape to Middle Earth. The Battle of Five Armies picked up right where The Desolation of Smaug ended. The mighty dragon Smaug is set loose on Lake Town and starts to destroy it without hesitation. The opening scene here is quite quick and, without any spoilers, a character meets his end. They should of just placed this scene at the end of the second movie and it would of worked out fine. If you've read the book, the last part is the great war, hence the title "The Battle of the Five Armies". To me it felt like the battle itself was dragged out. It was still good though. The one thing I liked from The Hobbit trilogy is that scenes not mentioned in the book were added in the movies. Gandalf in the book and the rest of the wizard crew don't have a lot of spotlight, but the way Peter Jackson wrapped things up was awesome. Everything fit in with the Lord of the Rings trilogy: all the side stories and side quests that Gandalf and other characters did. Legolas' storyline was a big plus that ties it all together. His last scene in the movie sees the elf headed north to meet someone special from the Lord of the Rings. The Battle of the Five Armies was awesome and I was sad to see it end. There was a lot of great special effects but one negative thing I have got to say is that one thing the original Lord of the Rings franchise did that the hobbit franchise didn't was use real extras in costumes. There was too much CGI throughout The Hobbit series. It was still great, but I wish Peter Jackson would have followed his same roots from the first trilogy. If you're a true fan, try not to cry and if you're into fantasy I recommend it as well. A good family movie and end to an era.